Citation: Oncotarget 2017 Jun 27;8(26):42076-42086. Sulfatinib is a small molecule kinase inhibitor that targets tumor angiogenesis and immune modulation. This phase I study (NCT02133157) investigated the safety, pharmacokinetic characteristics, and preliminary anti-tumor activity of sulfatinib in patients with advanced solid tumors. The study included a dose-escalation phase (50-350 mg/day, 28-day cycle) with a Fibonacci (3+3) design, and a tumor-specific expansion phase investigating the tumor response to treatment. Two sulfatinib formulations were assessed: formulation 1 (5, 25, and 50 mg capsules) and formulation 2 (50 and 200 mg capsules). Seventy-seven Chinese patients received oral sulfatinib; the maximum tolerated dose was not reached. Dose-limiting toxicities included abnormal hepatic function and coagulation tests, and upper gastrointestinal hemorrhage. The most common treatment-related adverse events were proteinuria, hypertension and diarrhea. Among 34 patients receiving sulfatinib formulation 2, one patient with hepatocellular carcinoma and eight with neuroendocrine tumors exhibited a partial response; 15 had stable disease. The objective response rate was 26.5% (9/34) and the disease control rate was 70.6% (24/34). Pharmacokinetic, safety, and efficacy data supported continuous oral administration of sulfatinib at 300 mg as the recommended phase II dose. 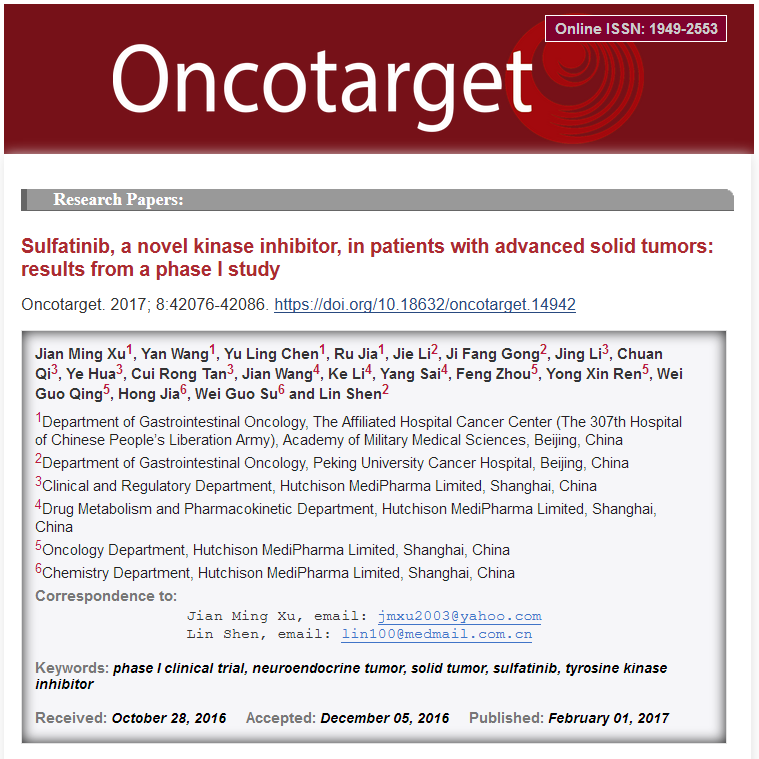 Sulfatinib exhibited an acceptable safety profile and encouraging antitumor activity in patients with advanced solid tumors, particularly neuroendocrine tumors.